Without treading into the territory of Not-Safe-For-Work, it’s a fair call that there’ll be plenty of pulses racing this Valentine’s Day, or at the very least there’ll be a few hearts aflutter. While you’re thinking about what makes your heart thump, spare a thought for the valuable stuff inside it – blood. This red stuff is surprisingly versatile and can be made into 22 different medical treatments, but it has a limited shelf life. The Australian Red Cross Blood Service needs consistent donations throughout the year in order to keep up demand, so if you’re not already on board, why not make it your new good deed for 2016? Why don’t more people donate? I don’t have the time – This is one of the most common problems with volunteering for anything, but did you know that donating blood doesn’t take that long at all? 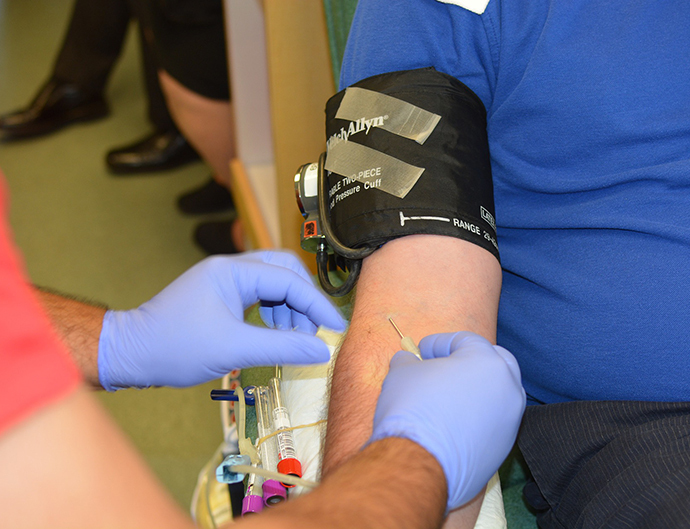 An appointment for whole blood donation (the kind everyone starts out with) takes just one hour. You can find out more about what an appointment involves here. Won’t it hurt? The feeling of the needle going in is a brief, mild sting at most and once it’s in, you’ll barely even notice it’s there. Take it from me personally, I’ve had the jab a bunch of times and it’s nothing to worry about. The agony of stubbing your toe lasts way longer than donating blood ever will. It’s scary to go alone – Who said you had to go alone? Provided you book in advance by calling 13 19 15, it’s entirely possible to get appointments for you and your friends lined up around the same time. You can also get your workplace involved through the Red25 iiNet has been participating for several years and it’s a great team bonding exercise as well as saving lives. Once you’ve got a few whole blood donations under your belt, you can also look at donating Plasma or Platelets. These specific blood products are vital to treating a range of conditions including immune disorders, burns and other trauma, haemophilia and cancer. An appointment to donate plasma or platelets takes a bit longer than whole blood because a process called apheresis is used. Your blood enters a centrifuge to separate your plasma or platelets from the rest of your blood, and then your red blood cells are returned to you along with fluids to replace the water content of the plasma you’ve donated. Because your red blood cells are returned to you, it’s safe to donate more often – typically every 2-4 weeks. This sounds good, how do I get started? If you’re keen to roll up your sleeve, you can check your eligibility and request an appointment at donateblood.com.au. Alternatively, you can give 13 14 95 a call and the friendly staff will talk you through registration. Better yet, if you’d like to start your own Red25 group to help the Red Cross Blood Service make up 25% of Australia’s blood needs through organisation and group donations, register online or call 1300 886 524. Have any tips for would-be blood donators? Share them in the comments. I was a blood donor from 25 years old to 50 plus years old later giving plasma on a fortnightly basis that’s fine and I loved to do this,first in the Perth clinic then later in the Carousel clinic at Cannington,at the latter stage Red Cross introduced about 500ml of saline solution to replace lost or donated fluids this was fine for a while. Then after a while my feet and legs began to swell and retain fluid when I asked about not administering this saline solution they declined also declined trying to do this to see if this was the cause of my swelling limbs,I was not happy that they would not at least investigate my problem as it may have been affecting others this way,so I decided I could no longer donate because of this swelling of my feet and limbs after donating. an interesting article……… They would get more people to donate if they did not live in the dark ages and actually let gay males donate blood…… This is an issue with them assuming that we all have HIV or other viruses when in actual fact everyone is at the same risk regardless of sexuality……. I am disappointed that iinet would support this given the clear discrimination displayed by the Red Cross. i think ive just noticed that my iinet adsl has been corrupted/modified by some indians who played with the wires out the front of my place. i would like to know if you are able to a port rebuild on your side of the server. Best to raise with our Support (13 22 58) team, Neil. A Customer Service Representative will able to investigate and run through any necessary troubleshooting to restore.